It is a struggle to pick my boys up and carry them around anymore. They are both extremely large for their age and also very articulate. I often forget that at six and four years old, they are still only very young. This trip has completely turned their world upside down. While this is all a big adventure for them, the first bit was often more the struggling type of adventure rather than the fun kind. As every parent knows, when the kids are miserable, everyone is unhappy. It is always blisteringly hot. The boys can’t walk down the road without the (quite legitimate) fear of being hit by traffic. Although the adults think the food is great, the kids are constantly confronted by it. We find ourselves searching for bland familiar foods that they can relate to. Also, outside of their iPods, we did not bring any toys. They really just want to sit somewhere and play Lego. On top of this, through unfortunate timing, my wife had to sit through a series of job application processes and an interview. She had to do all this with no real personal space on a dodgy computer via a slow and intermittent internet connection. That is pretty much the opposite of a holiday. The boys don’t have the capacity to get out and do much. Even if they did, most of the activities going here are adult focused. There are heaps of places to go for massages, yoga classes and a whole swathe of new age treatments. That is largely the draw card of Ubud, but it is of no interest to the kids. After spending so many years in and around Byron Bay (Australia’s backpacker hippie Mecca) it is funny to see the same stereotypes and hear the same conversations here. I took the boys to the Bali bird park the other day. It was a very well run bird zoo which the boys enjoyed immensely. Lots of the birds just lived out in the open or in big aviaries. All the signage was done with neat little pictograms which explained the birds habitat, food and nest type. The boys thought this was great, and spent as much time reading the signs as looking at the birds. 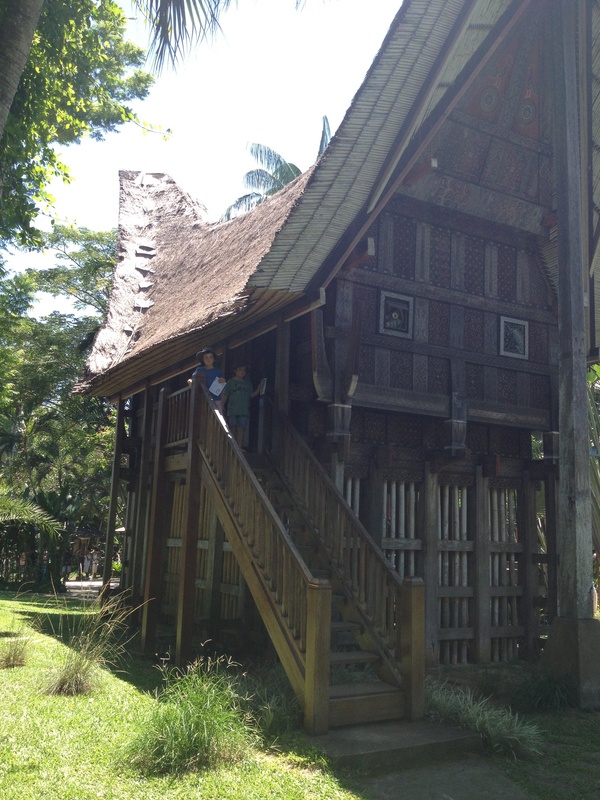 There was an amazing Toraja style house from Sulawesi, which was actually used as the owl house. We hired a driver to take us out there. Once we arrived, he hung around in the car park for several hours waiting for us to come out. Although he has taken loads of people there, he has never had the available money to warrant going inside. The boys just could not understand this, despite questioning him persistently about it on the way home. To try and give the boys a sense of belonging in the area, we spent another morning wandering fairly aimlessly through the many tangled little pathways off the main streets. This was an interesting morning in itself, just taking a relaxed look at the details of a different kind of ordinary. There were new plants and animals to look at, unusual styles of buildings, people going about their various jobs. We passed quite a few little fields tucked away between the houses. Generally, they are growing either rice or bananas. Usually they look a bit tatty, but I notice that the fields next to the expensive villas are in immaculate condition. 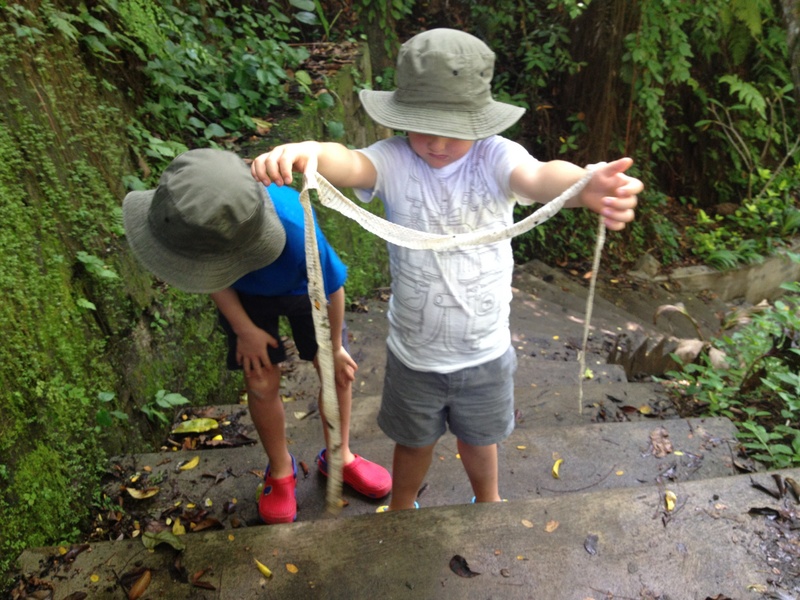 Exploring down a flight of steps, the boys found a large snake skin draped along the path. As much as being a fun little walk to go on, it really gave the boys a sense of space and an understanding of where they are. They feel much better for knowing their way around and not being lost all the time. Also, I like the idea that we can wander at random with two small children down unknown twisting pathways and still feel completely safe. Everybody I meet is polite and friendly. This is quite at odds with most of my other journeys abroad, and several at home. We made sure to buy a heap of craft stuff for the boys to play with as well. They make origami figures and elaborate little board games and draw pictures. It gives them some space for quiet time which was much needed. As the boys settle in, their confidence is growing. My four year old ordered some lunch for himself and his brother off a street vendor yesterday. The guy seemed very unused to being approached by foreigners, and the boys did not end up liking what they ordered. The fact that they thought it up and organised it though, was pretty impressive I thought. Our time here is nearly up. We have hired a car and driver to take us across to the north west corner of the island tomorrow. We plan to spend the next bit of our trip snorkeling at Pemuteran. 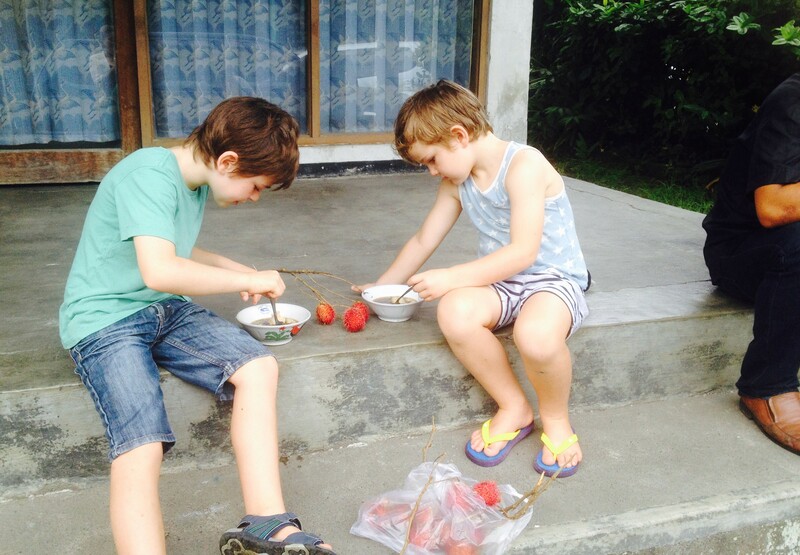 This entry was posted in Life experiences, Teaching and learning and tagged bali, bloke, confidence, homeschool, learning in context, life experience, safety, self determination, socialisation, travel, ubud. Bookmark the permalink. 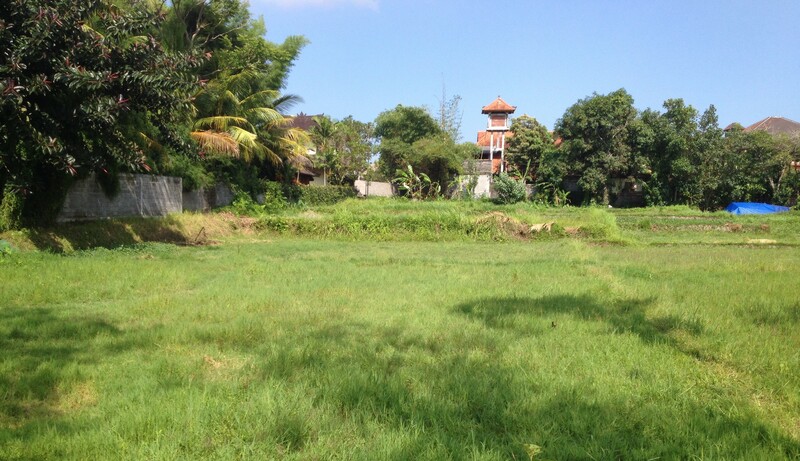 3 Responses to In and around Ubud. I was wondering how hard it would be with children (mine could simply not make the 25 hour long flights!) Did you visit the monkey forest? One of the few places I’ve gone without a scooter trying to run me over! Glad you are heading to a beach; that should be more spacious. We are leaving tomorrow for Sanur. Happy travels! We never made it to the monkey forest. People kept telling us the monkeys would try to steal all our stuff and freak the kids out. I hear there are other similar places along the way, and near Pemuteran, where the monkeys are not so aggressive. We will have a look there. Enjoy Sanur.